Zouis is the ship name for One Direction member Louis Tomlinson and former member Zayn Malik. With 2044 fanworks on the Archive of our Own, it is the 3rd most popular intraband pairing for Louis, and the 4th for Zayn. 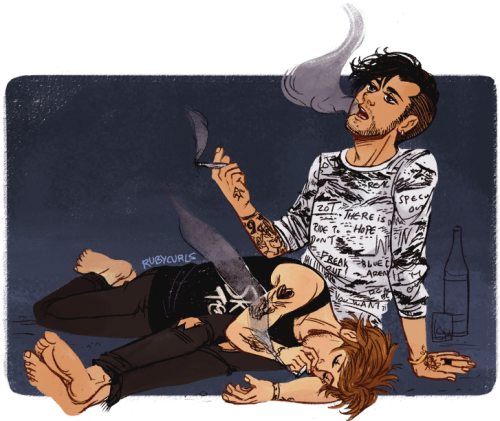 There are a number of canon details that shape fandom characterization of Louis and Zayn as stoner dudebros. They were the two band members present in the May 2014 weed video; Louis and Zayn canonically own a Scooby-Doo "Mystery Machine"-styled van together; and Louis and Zayn have matching "Bus 1" tattoos, a reference to their "chill" tour bus. Despite initial assurances that both sides were amicable, after Zayn's departure from 1D in March 2015, Louis took to Twitter multiple times to express his dislike of Zayn's friend Naughty Boy (which fans applauded), but these eventually led to Zayn's harsh May 6 tweet to Louis (which fans grieved). Many fans have applied Louis' lyrics from Made in the A.M. to Zayn, as in this Zouis gifset featuring the bridge from "History". ↑ sugarscape, Remember that random Mystery Machine car that Louis Tomlinson and Zayn Malik decided to have built one day? Yeah, that was weird. This page was last modified on 15 April 2019, at 21:03.